Saturday began with a misty morning bus ride from Alajuela to Guacimo to visit Earth University, a prestigious school with approximately 400 students who all study agronomy. Upon arriving, members of our team led a group of university students in a few interactive exercises and games to help us get acquainted with each other and share some good laughs. We had the opportunity to continue learning more about the students and their work at Earth over lunch conversations in their cafeteria. Following lunch, a student named Michael walked us through a portion of the research areas where students are experimenting with raised beds, vertical agriculture, hydroponics, and more. One of their goals is to identify efficient and sustainable methods by which individuals in urban areas can grow food in smaller spaces. They also strive to develop ways for waste items like tires, construction blocks, and plastic bottles to be used for constructing the beds and gardens to grow these plants in. The university communicates its research to the surrounding community by conducting tours for interested visitors and through informational videos posted on their YouTube channel. Our afternoon and evening consisted of a visit to a community in an area not far from the university. As we walked with our guide, we were shown houses, the community’s health clinic, two of their three grocery stores, churches, and more. We finished our time there for the day at the community center with Rojer and his family. Rojer welcomed us enthusiastically and dived in to asking us about our perceptions of Costa Rica before arriving and our experiences thus far. He helped us understand more of the richness of Costa Rican culture and some of the challenges currently being faced, such as a loss of knowledge of preparing traditional foods and speaking a dialect unique to Costa Ricans that are also of African descent (as Rojer is himself). If what we witnessed and experienced today had to be summed up in one word, I would say it’s “cultivation”- and not just because of the lettuce, tomatoes, bananas, and herbs being grown that we saw throughout the day. Earth University is dedicated to cultivating a community of students who will go forth with both the technical knowledge and real-world experience necessary to become the next wave of agricultural leaders in all the places from which the students hail, whether it’s Ecuador or Sierra Leone. 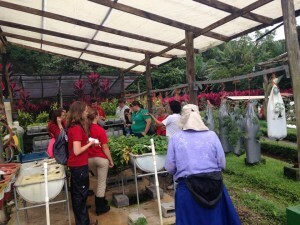 The university also works to cultivate communities in Costa Rica that are more sustainable in resource use while also being more productive. Rojer shared with us his passion for cultivating pieces of Costa Rican culture that are quickly being lost by the current generation by providing hands-on learning opportunities for Costa Rica citizens and visitors alike. As the evening came to a close, we left with a challenge from Rojer. It was a challenge to cultivate our own traditions and characteristics that form the cultures of our home towns and state because, just like Costa Rica, we too are rich in diversity and the potential of what we have to offer the world.